Paper-cutting is one of the oldest and the most popular folk arts in China. Meanwhile,Western fairy tales are so romantic.It is a creative idea to combine them together as fusion of Chinese and western. The paper box emits soft warm light and blue light through multi-layer paper and appears a vivid 3D picture,which makes you a romantic life. The darker the surrounding is,the better light effect becomes. A special night light for babies,kids,elderly,girlfriend,mother and some one important to you. It is also an excellent gift for Baby shower /New Year/Kid's Birthday/Christmas/Valentine Day/Anniversary. We offer one year warranty.Please feel free to contact us if you have any questions anytime. 1.EASY TO USE: Charged by USB cable and can be connected by 5V adapter which is more convenient and safer and is impossible to catch fire. 2. 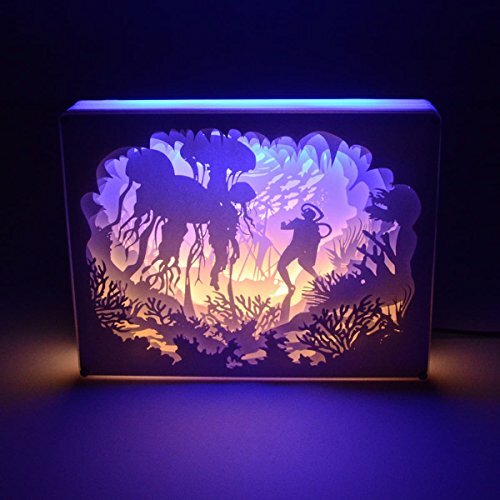 ECO-FRIENDLY MATERIAL:Made of multi-layer paper which is carved with the laser tech and framed with harmless acrylic.Using a low power safety LED strip as source. 3.UNIQUE DESIGN: The creative new design compromises the Chinese traditional paper-cutting technic and the newest modern laser tech.With the soft white and blue LED light behind the paper,the shadow appears a vivid 3D picture. 4.UNDERWATER DIVING:The mystery of the ocean has fascinated divers for years. When diving, people are transported to a completely different world of plants and animals where they learn that the ocean is a natural and peaceful place. 5. WHAT WILL YOU GET: 1 pcs paper-cutting light box,1 pcs USB cable,1 pcs 5V adapter,our worry-free 12-month warranty and friendly, easy-to-reach customer service. If you have any questions about this product by JONYOU, contact us by completing and submitting the form below. If you are looking for a specif part number, please include it with your message.